A Prussian cavalry officer who traveled to the United States in search of gold and learnt the art or "Injun Fighting with the pistol and "Bowie Knife" Von Tempsky sailed on to New Zealand where he became a leader of the "Forest Rangers". He was known as Manu Ra or "One Hundred Birds" by Maori who said it was if he was everywhere. A gifted painter, his beautiful artworks of his adventures in the bush seem utterly at odds with his penchant for fighting Maori at close range and in their own space. At first glance this image of him might seem decidedly romantic. 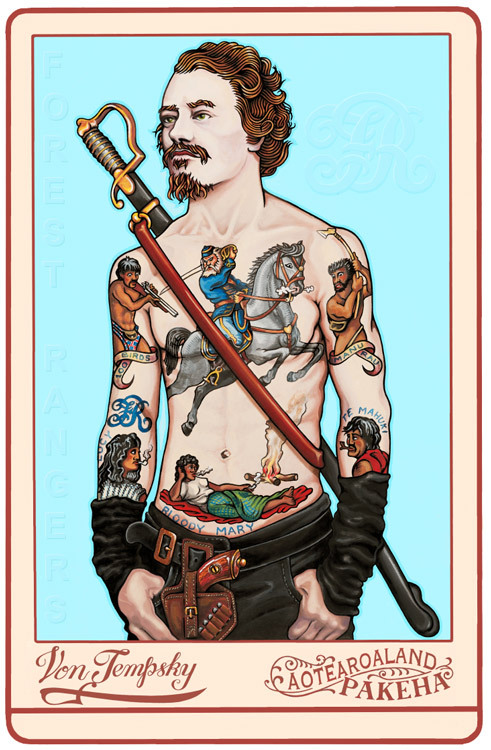 However, the face is taken from a photo of the actual man and his tattoos are based on his actual artworks. the devil may care look to him is very true to who we understand him to have been. He died rescuing another fighter, some say chasing the Victoria Cross that Charles Heaphy had won fighting alongside him at an earlier engagement. He was a prized catch for Maori and it is reported that because of the esteem the held his war like nature in he enjoyed the ceremony of a funeral pyre rather than being eaten. His sword and personal belongings were kept to be hidden for all time. Von Tempsky was a man of his times, an artist, writer and warrior, bread to understand that life was best expressed through art and the written word and lost in battle.